Yes, this post is about deviled ham; no, it is not about deviled eggs, though those are awesome. Today was a surprise stressful day- one of those days that dawns like any other, but a routine appointment turned into an all-morning affair, which meant arranging for someone to hang out at our flat to wait to let in the boiler repair guy who was running late and didn't arrive until shortly after I got home. He was supposed to be doing routine maintenance but quickly realised that our entire boiler somehow needs to be moved UP 15 centimetres in the wall, and while he was doing that, the Council showed up to check on why our back garden is flooding and needed to dye the water in my sink an ecto-plasmic green to see where the blockage is, totally freaking Holtzmann out and did I mention that the boiler guy is scared of dogs? After they all left and I recovered from the stress of the morning and re-assembled my kitchen, I decided to make the dinner* I had already bought ingredients for, deviled ham and eggs, getting angrier and angrier as I realised that this, too, was probably not going to go to plan and I was going to be left with an unpleasant breakfast-for-dinner situation after my unpleasant appointment, boiler, sink and dog situations of the day. So I angrily chopped ham and snipped chives (have you ever tried to snip things angrily? 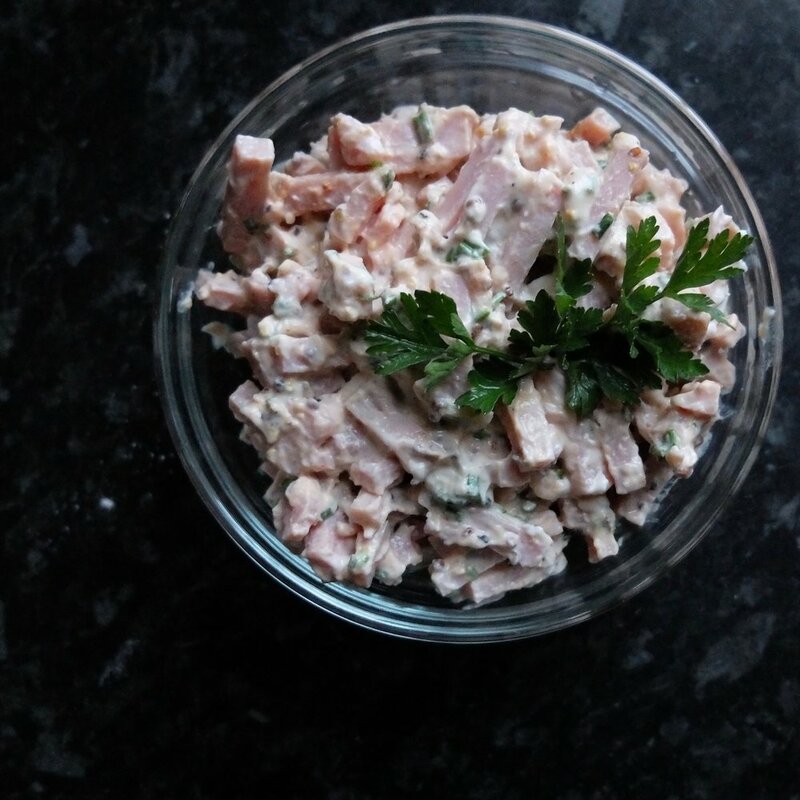 It doesn't work very well) and mixed then tasted then mixed some more and... suddenly I had deviled ham so delicious I didn't want to wait for dinner because I was too busy eating it off of a spoon at 5pm. And if I ever thought deviled ham could make my day brighter, may the good lord strike me down as I type, but here we are. This is kind of a freebie recipe because it's the printed meal recommendation on the back of the recipe for last week's rice pudding, but I decided to make it anyway because, I guess, I'm a sucker for punishment (or so I thought, until I made it). But then I made it, and, surprise, it was delicious. Having no access to tinned or prepared deviled ham, I made my own, and thus got to make it as spicy as I wanted, which, after the day previously described, was VERY. In the process of so doing, I looked up deviled ham recipes and learned that the Underwood Deviled Ham logo is the oldest trademarked logo still in use in the US, which is pretty cool and very random since I swear I've never seen it before (except, maybe, when previously making deviled ham for this quiche). Anyway, after reading a whole bunch of recipes to get the gist of what should go in deviled ham (I haven't made it except for the aforementioned quiche, and I couldn't really remember how to do so), I personalised the recipe to my tastes and it was great. This means it's not a super authentically 1950s deviled ham, but if you like spice, ham, eggs and breakfast foods, this is for you and you should totally try it on the weekend. Best served, according to the recipe card, with ideal coffee, but it works equally well with sparkling water and a tomato salad. If you're not into the idea of deviled ham with eggs as a main course, whip yourself up a batch of the ham anyway and serve it with crispy crackers. It's awesome. *This dish is technically supposed to be for breakfast, but I didn't want to wait for the weekend so we had breakfast for dinner and COME AT ME if you want to discuss whether this is stupid. 5 spoons out of five. Deviled ham plus scrambled eggs plus toast equals comforting breakfast food guaranteed to kick a hangover on the weekend or, you know, improve your weekday by 34%. Stir in cream cheese, hot sauce and mustard, a little at a time, until desired consistency and flavour is reached. Add chives, parsley, lemon juice and pepper and mix well. Taste and add salt if needed (mine didn't) or additional hot sauce (mine did, but that's because I wanted blow-your-head-off levels of heat). Set aside mixture while you softly scramble two eggs per person and toast 1 slice of bread per person. Pile scrambled eggs and deviled ham on top of toast and enjoy!